It’s hard to say what makes a dinner party a good one. I think it’s some alchemy of food, wine and personalities that all comes together when it works and leaves you looking for the earliest chance to leave the table and go home when it doesn’t. My husband invited several people from work over Saturday night. I had never met most of them and was feeling a little pressure to put out some better than average food since I knew he’d been telling them about this blog, so to be completely honest, I wasn’t really planning on having a great time. In fact my plans included lots of wine and hiding in the kitchen with last minute tasks and preparations while he entertained them all. But then they all arrived and clustered in the kitchen, so I had nowhere to go. And, when we all sat down to eat, magic happened! 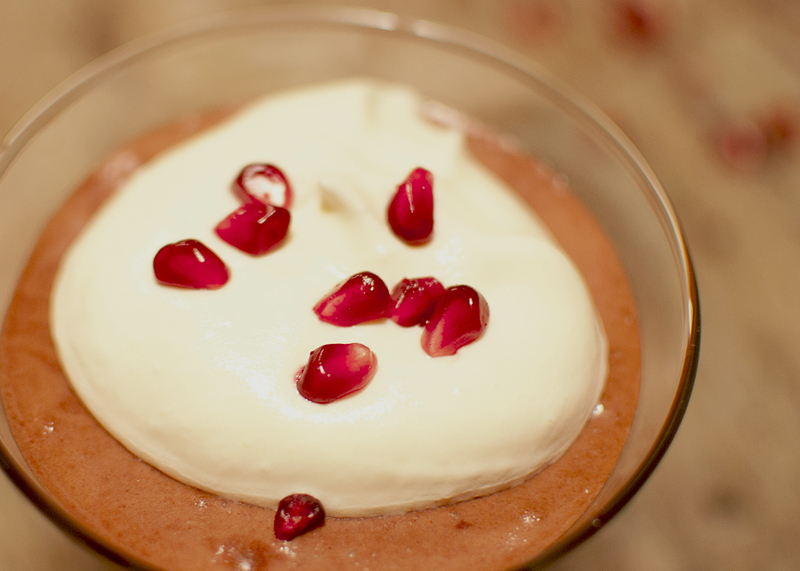 Even though, I’d had my mousse fall apart on the first run which resulted in an extra trip to the store for more chocolate, the rest of the dinner actually turned out really well (and so did the mousse in the end) and everyone seemed to really enjoy it. More than that, conversation was lively and thoughtful. We were lucky enough to have people from India, Mexico, Korea and the US all at our table. We brought up politics and religion, those taboo subjects destined to kill a party, but this time it didn’t. Ideas were shared, mousse was eaten and appreciated, technology and its impact on humanity was discussed and quince liqueur was savored. Everyone sat at the table long after the last bite was finished and the last sip sipped, just enjoying the company of each other. When everyone did leave, I said goodbye hoping I’d get to see them all again. It was a rare and lovely evening, made even more fantastic by the fact that my husband cleaned and put away every last dish before we went to bed. Ahhhhh, the perfect dinner party. I loved your description of the alchemy and the menu. I think the host (s) can set the stage (or the table, as the case may be) and in so doing, inspire the chemistry of the guests to create the feeling that this-is-a-special-evening. It all begins with the joy you bring to planning, preparing, creating, M. Everything miss en place.